The Cathedral Choir is made up of twenty-four boy choristers and fourteen gentlemen (made up of seven lay-clerks and up to seven choral scholars) who contribute to the pattern of daily cathedral worship. The choristers rehearse on weekday mornings at 8.00am before a normal school day in preparation for the week’s music. In any normal week the Cathedral Choir sings for at least 5 services. The Choral Scholars also form a close-harmony group who are available for bookings – please email for more information. 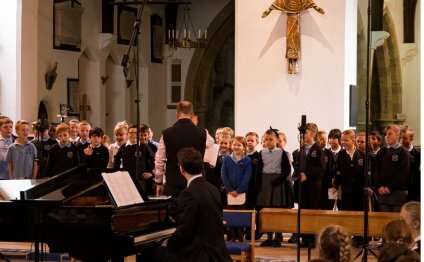 The choristers are educated at Portsmouth Grammar School that, as such acts as our choir school (also see Choir Schools Association). Opportunities exist for counter-tenor, tenor or basses who, having completed their school or university education, are looking for the chance to sing and work within a cathedral foundation for a year with a Choral Scholarship. Please see the page on Gap Year Opportunities and e-mail the for further information. The choir plays an important role in the life of the Diocese and City by singing at Ordination, Confirmation, Civic and Remembrance services. The choir is often invited to sing at churches throughout the Diocese of Portsmouth. The Royal Marines’ School of Music is now based in Portsmouth, and the choir and Orchestra or Band of the Royal Marines regularly work together. The choir has been at the heart of recent DDay Commemorations in Caen and Bayeux in Normandy, France and here in the UK. The ceremonies saw BBC Radio broadcasts, a concert in Caen with the London Mozart Players and appearing at the International Service of Remembrance at Bayeux in the presence of HM The Queen, President of France and The Prime Minster and an International Drumhead Service on Southsea Common in the presence of The Princess Royal. The 200th anniversary of the Battle of Trafalgar and death of Lord Nelson involved the choir performing at a number of international and national events. Notable amongst those was the International Drumhead Ceremony during in the International Festival of the Sea in June, and at events aboard Nelson’s flagship, HMS Victory, during Trafalgar Week (including three BBC radio and TV broadcasts). Our ‘Nelson year’ concluded with a live broadcast of Choral Evensong on BBC Radio 3 on the day 200 years ago that Nelson’s body sailed from Portsmouth to London for his State Funeral. The choir has also made a number of recordings, the most recent being a reconstruction of music from Admiral Lord Nelson’s Funeral released in 1999 year and ‘I look from afar’ – a recording of Advent and Christmas carols released in 2001- all of these are available through the label. We have just released ‘Portsmouth Remembers’ through Guild Records- a re-release of a 1984 LP recording with an extra half-an-hour from the present-day choir. We have just completed a recording project with Clare College Choir, Cambridge, Mark le Broq and the Britten Sinfonia (under Andrew Parrott) of Harvey Brough’s DDay 60 ‘Valete in Pace’.